The Shrimp Rich Boy is one of Mendocino Farms’ seasonal offerings, a combination of garlic marinated cajun shrimp with a meyer lemon relish aioli, bacon, their ‘krispies,’ candied jalapeño, tomatoes and shredded romaine on a soft white roll. While I could see some purists decrying a ‘take’ on the po’boy, I have no such attachment to this particular archetype and so, provided the resulting sandwich is a good one, I do not mind. And the resulting sandwich at Mendocino Farms is quite good, although it could have been better. The krispies at Mendocino Farms stand in for fried foods, with mixed results. They’re not so pleasant on the not so fried chicken, but fit in quite well on the turkey confit sandwich I sampled. Here they’re much more towards the fitting in end of things, but they also call to mind the fact that the shrimp in the pseudo-po’boy you’re eating aren’t fried, and that the sandwich would be much better if they were. I get why Mendocino Farms doesn’t deep fry things, but that doesn’t mean they’re not missing out. The shrimp here were cold and firm, and while they were flavorful I think this sandwich would have been a real delight had they been hot and had a crunch to them. So there was that what-could-have-been and a lopsided stuffed construction, but overall this was a fine sandwich. The candied jalapeño was a nice touch, and a nice change from the pickled and fresh that are commonplace. 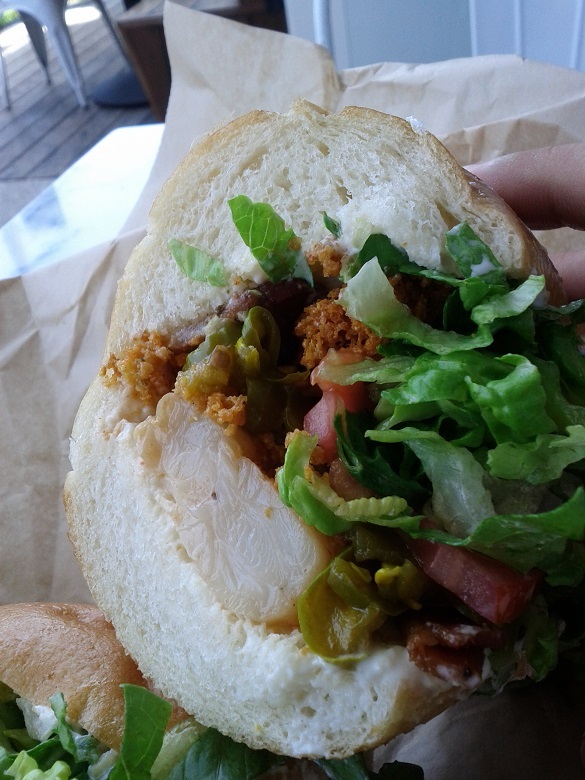 Mendocino Farms sometimes misses the mark but the sandwiches are never boring, and that’s enough to ensure my return. This entry was posted in Sandwich Reviews and tagged Fish, Los Angeles, Mendocino Farms, Reviews by Pete, Sandwiches I Have Eaten by Pete. Bookmark the permalink.